We have told our contributor, who was very grateful for Ariejan’s help. 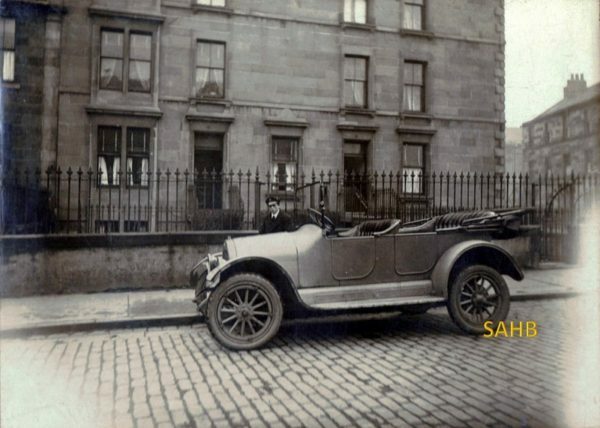 “A viewer of our website has sent us this wonderfully evocative photograph of a small charabanc outside the home of one of his antecedents in the 1920s, with a chauffeur in attendance. He is wondering if any of us might be able to identify the make of vehicle. The photo was taken in Edinburgh outside 55-57 Albany Street, Leith – which is now Portland Street. We shall pass on all information to the owner of the photograph – and we’ll make sure we put any identification on the website (anonymous or not).